Polis (or Polis Chrysochous; Greek: Πόλη Χρυσοχούς or Πόλις Χρυσοχούς) is a small town at the north-west end of the island of Cyprus, at the centre of Chrysochous Bay, and on the edge of the Akamas peninsula nature reserve. It is a quiet tourist resort, the inhabitants' income being supplemented by agriculture and fishing. Polis is served by the fishing port of Latchi. Polis is close to the beautiful Akamas peninsula, a nature reserve. Marion (the original name of Polis) was already inhabited at the end of the Neolithic and through the Chalcolithic period. It began to prosper from the Cypro-Archaic period onwards and became one of the most important ancient Cypriot city—kingdoms in the Cypro-Classical period with important commercial relations with the East Aegean islands, Attica and Corinth. In 312 BC, it was conquered by Ptolemy I and the kingdom was abolished until its reconquest by Ptolemy II Philadelphus who renamed the city after his sister and wife. The new city was smaller than Marion but it also flourished due to its close proximity to the copper mines. In Egypt at Medinet Habu in the temples of Ramesses III, there is a large 12th-century BC inscription which refers to Cyprus. 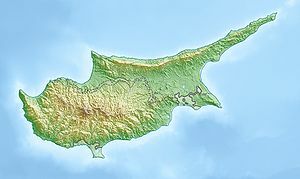 The names of Cypriot towns mentioned include Marion. However, the first definite reference to Marion occurred in 449 BC, when the city, as indeed other city-kingdoms of Cyprus, was under Persian rule. During that year, Kimon, the great Athenian general, freed the city from the Persians. Later, the ancient geographers spoke of the town as "Marion Ellinikon"—The Hellenic Marion. The Kingdom was rich in gold and copper ore, mined chiefly in the nearby Limni Mines. It was the natural wealth which led the city to a period of flourishing trade, especially with Athens, which in its turn, exported many Attic pots to Marion. Samples of this pottery can be viewed at the Polis Archaeological Museum. According to tradition, Athenian Akamas, son of Theseus, disembarked near Polis after the Trojan war and gave his name to the Cape of Akamas and the city of Akamantis, a legendary city which has never been found. In ancient times, Polis was known as Marion, and was probably founded by Akamas or a certain Marieus. Marion was one of the city-kingdoms founded by the Mycenaeans when they came to Cyprus. The Mycenaeans, or Achaeans, were the creators of the Mycenaean civilization in Greece, and they settled in Cyprus between 1400 and 1100 BC. The Greek presence and the cities linked to the settlement of the Mycenaeans in Cyprus can be verified by inscriptions found in neighboring countries. The harsh battle for Cyprus between the successors of Alexander the Great, Antigonus, and Ptolemy led Marion to destruction. Ptolemy, who finally prevailed, laid waste the city whose king had taken the side of Antigonus, and transferred its inhabitants to Paphos. Later, another member of the Ptolemy dynasty, Philadelphus, founded a new city on the ruins of Marion, and gave it the name of his wife, Arsinoe. The city, under its new name, prospered during the Hellenistic and Roman Ages. In early Christian times it was the seat of a bishop. In early Byzantine times it seems to have suffered extensive destruction during the period of the Muslim conquests of the 7th century. Archaeological evidence indicates that the city was also inhabited during the late Medieval period between the 12th and 14th centuries when reference was made to Chrysochou and later, Polis Chrysochou. The local Museum of Marion - Arsinoe at Polis was founded in 1998 by the Government of Cyprus and Nicos Shacolas. The museum consists of three exhibition spaces—Rooms I and II and the Atrium. Objects in Room I derive from an extensive area around Polis and are chronologically arranged, so as to portray its historical development from the Neolithic and Chalcolithic to the Medieval periods. Another museum, the Polis Culture Centre contains theatre stage and a 400-person capacity seating area. The Baths of Aphrodite and the recently discovered ruins of the medieval Georgian Orthodox monastery of Gialia are located near the town. Nowadays, Polis is the administrative centre of the area which includes 23 communities. Ruth Evershed a fictional MI5 analyst and spy at the Spooks series, lived in Polis for some time. ^ "Meteorological Service - Climatological and Meteorological Reports". This page was last edited on 14 February 2019, at 06:12 (UTC).